Despite having a healthy food blog and focusing on general wellness in my life, I admittedly have the worst bedtime habits. Ever. I do all of the things that you’re not supposed to do every.single.night. I just wrote out my entire, God-awful bedtime routine that breaks every healthy sleep habit ever created but then deleted it. I realized it would probably lull you into sleep. In hindsight, I should have kept it up so I could read it to myself every night but I’ve decided to start focusing on incorporating healthy sleep habits into my life not adding more. 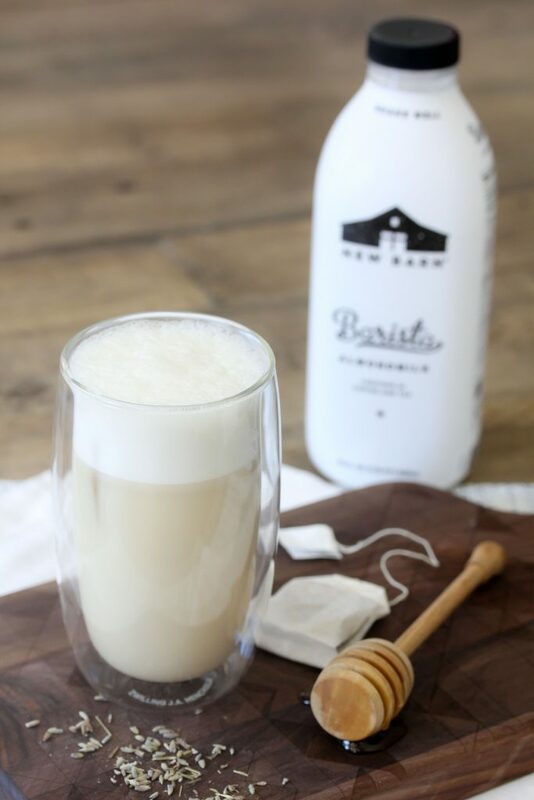 So enough mumbo jumbo, let’s get to the good stuff like this Chamomile + Lavender Latte (lovingly dubbed the bedtime latte) with New Barn’s brand new Barista almond milk. Which I cannot get enough of. If you’ve been reading my blog or following me on Instagram for any given amount of time, you know that I am huge fan of New Barn. Not only of their products but of the company and the people behind it. I’ve had the opportunity to meet so many members of their team and have loved them all. When the people behind the company match the quality of their product, I’m a lifelong fan. And that’s New Barn. 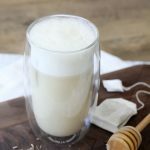 I’ve always used New Barn almond milk in my coffee and tea drinks because the quality is far superior to that of other almond milks. New Barn uses organic ingredients and no junky additives to create their almond milks. Their Unsweetened version is even Whole30 compliant! So when I found out they were creating a blend that was designed specifically to be used in hot or cold beverages that wouldn’t separate and would blend beautifully hot or cold, I was so excited to try it out. I created this Chamomile + Lavender Latte because I wanted to create something comforting before bed that I could indulge in other than whatever snack was in my pantry. 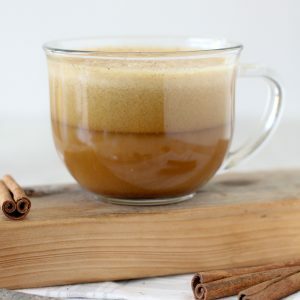 I also wanted to create a drink that could be made hot or cold because with summer just around the corner the last thing I want is a piping hot latte when it’s still 98* (hehe) outside. 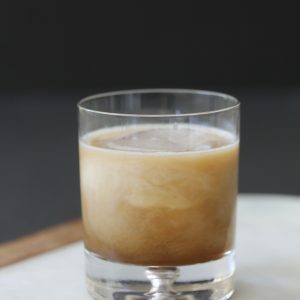 I initially thought that I would need two different recipes to account for the hot and cold drinks but I ended up with one recipe that will work for both versions. Just note, in the cold version you will need to chill your tea so make it ahead of time. And in reverse I choose to heat my New Barn Barista blend up a bit for the hot version so I get a piping hot latte. It’s also important to steep your tea stronger than you normally would if you were just drinking it straight as the flavor will be diluted by adding other ingredients if you don’t. I also want to make it clear that you don’t need any fancy sort of coffee foam-er machine to make this latte. 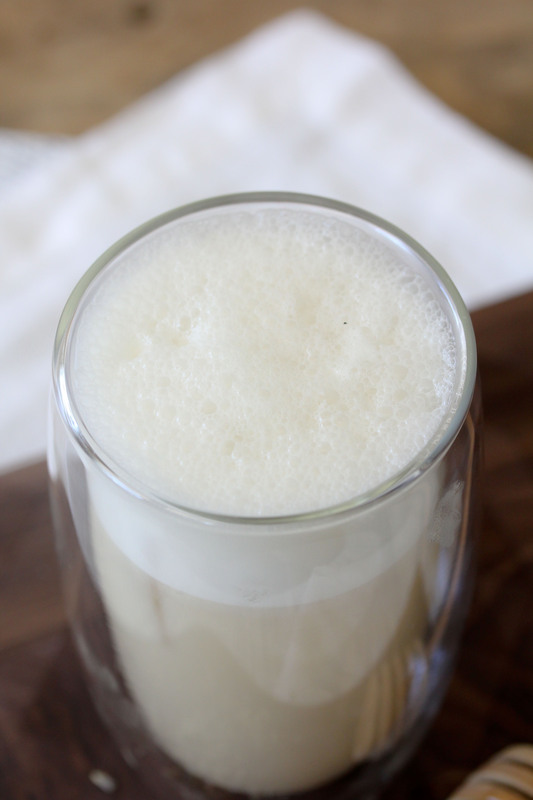 You can make it in your blender and it will foam up just the same as a latte you’d get at a fancy coffee shop. New Barn’s Barista almond milk foams up like no other! The bit of added sugar helps facilitate creating the structure of the microfoam without the use of junky additives. You can use any sort of chamomile tea that you like, whether it’s bagged or loose leaf. As far as the lavender, I purchase mine from Whole Foods (coincidentally the same place you can buy your New Barn Barista almond milk!) in the spice isle. 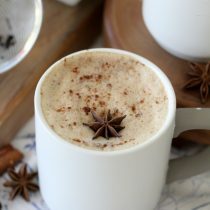 If you cannot find it, this latte is just as delicious as a Chamomile Latte so feel free to skip it. 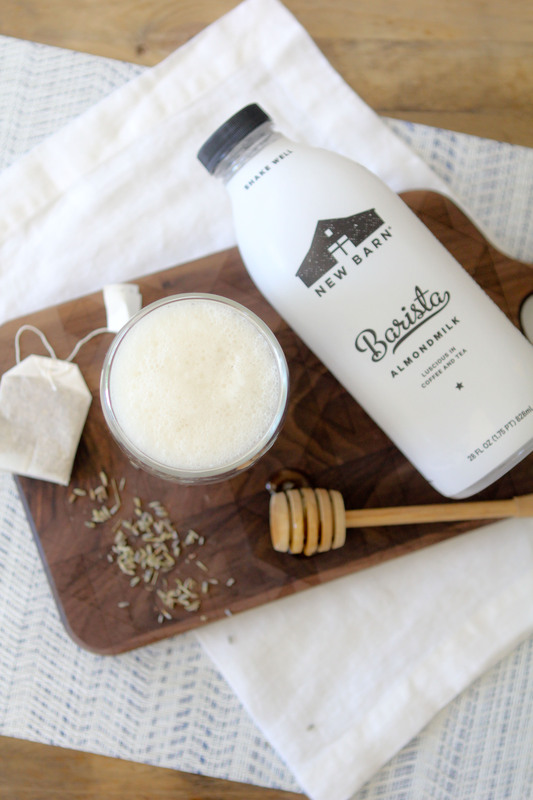 A delicious bedtime latte featuring chamomile, lavender and New Barn Barista almond milk blend from the Whole Smiths. Paleo-friendly and vegan. Steep the tea bags and lavender in the hot water for 4 to 5 minutes. 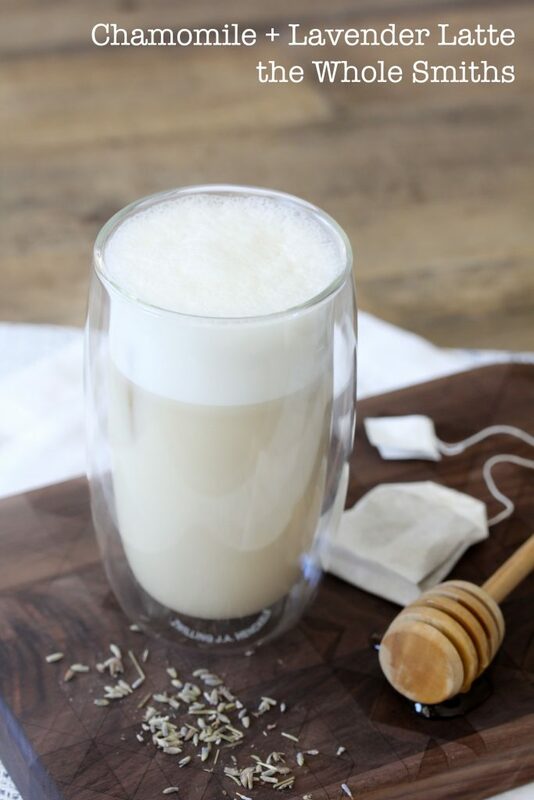 If you are making the latte iced, cool the tea in the refrigerator for a minimum of 2 hours. Add the tea, honey and New Barn Barista almond milk (heat the almond milk if you are planning to make it hot) into a blender and blend on high for 10 seconds. To serve iced, pur over ice. To serve hot, simply pour into your mug and enjoy.